The sixth in the series of books about the Bridge playing Monks of the St.Titus monastery is the first without the name of Terence Reese on the front. Eight out of ten for this book which is not quite up to its predecessors. 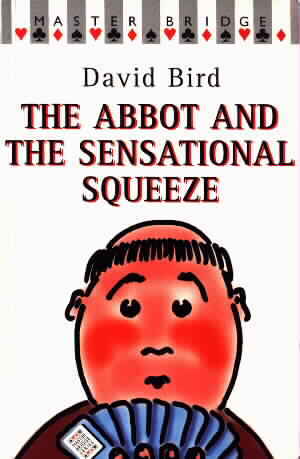 This is the first book in this series to be credited solely to David Bird. Previously, the magazine articles written by Bird had been revised by the original author together with Terence Reese prior to book publication. After the death of the latter, David Bird continued to work alone. Of course, he was always the original author and it was never made clear exactly how great an input Reese had to the book revisions. Like all of the other works in this series, this book follows the adventures of the fictional bridge playing monks of the order of St. Titus. Each chapter sees the monks in some bridge situation where they play a number of hands. The bidding is normally English Acol style but this is secondary to the play of the hands which is where the interesting bridge problems can be found. While the earlier books all concentrated on the exploits of the monks in England, they also contained a number of chapters detailing the exploits of a missionary outpost in Africa. Political correctness having see off that scenario, the "away" section of the book has the Abbot, the leading character, playing as the guest expert on a bridge cruise, an interlude which is a lot less funny than the rest of the book. If you are new to the monks of St.Titus, I would recommend that you first track down some of the earlier books. Especially the first two: "Miracles of Cardplay" and "Unholy Tricks" as they are funnier and fresher. However, if you are already a fan of these books, do not hesitate. Reese may be missing from the front cover and the wit may not be as sharp but you will still enjoy the contents.